The Pocket Mod looks like it could cruise around the Italian streets while fitting into the surrounding scenery flawlessly. Thanks to its stylish Euro-Style appearance and a chain-driven electric motor, the Razor Pocket Mod can go at about 15 miles per hour with variable speed, and travels up to 10 miles on a single charge. For more power, for adults try Razor’s EcoSmart electric scooter. It can carry up to 150 pounds worth of weight, and can vary the acceleration and variable speed accordingly. If you need convenience and style, don’t hesitate to read on about the Razor Pocket Mod Electric Scooter! The deck where your child will be holding their feet is thick enough to feel stable, and wide enough to have enough room to move around when riding. They also shouldn’t have problems getting trapped within the small space, since the frame was designed to be versatile. All in all, the deck and frame of the Razor Pocket Mod is clutter-free, and easy-to-use, allowing for a smooth ride. The deck also supports a kick-stand, so that you can park anywhere, anytime. You can retract if from the center of the deck and pause whenever you need. The stand ensures that your Razor moped won’t lean, tip or fall-over, either. All in all, the assembly of the Razor electric sports mod scooter is also very intuitive and easy. The mod scooter comes with a manual that will help you get started with the putting-together, and the instructions are easy enough that even the kids can join in! The pocketmod scooter also has a durable steel frame that is built to last. You will not only be paying for the features of the mod scooter, but for its sturdy frame and make, too. The steel material also helps limit the possibility of rust building up, as long as the mod scooter is taken care of properly. The classical Italian design of the frame also helps attract young riders. Vintage-looking products usually have a charm of their own! Unlike many scooters, the pocket mod scooter actually features a front-light. This ensures on-going fun during dim humid summer nights, or during the fall seasons when it gets dark quickly. It’s the ideal additional feature that helps the fun continue at all times during the day. A small trip to a friend’s house or to a corner shop after the sun sets will be easy and effortless with the Razor Pocket Mod front light. It shines bright, clearly shows the road in front of the rider, and is powerful enough to light up just enough ground to help the rider feel safe. For utility purposes and general-fun, Razor also decided to include a storage compartment within the Razor Pocket Mod. In essence, it makes this already Euro-Style looking scooter more stylish and gives it a distinct Italian vibe. You will be able to pack anything you need within the compartment, from a hoodie, to a coat, to food, toys and other necessities that you may need during your ride. The compartment hatch closes securely, and holds all the belongings tightly and safe. The shape of the seat itself (under which the compartment is hidden) has the perfect comfy shape for anyone that ends up sitting on it for longer periods of time. The Razor Pocket Electric sports mod a high-torque chain that drives the electric motor as soon as you flick the on-switch on the scooter. This electric motor in particular allows the electric Sports Mod scooter to go at impressive speeds. The Razor scooter reaches speeds up to 15 mph or more, depending on the weight of the rider themselves. Because of this variable speed, it’s important to familiarize your child with the user manual before allowing to ride the scooter. A few lessons in balancing before even turning on the scooter can save a lot of accidents and bumps along the way. For younger children, fifteen or so minutes of just training the balance on the turned-off scooter can help raise the confidence of the rider. Especially since the electric motor is powerful, and controlling it at full or even half speed can be difficult. You will see many kids wobbling from side to side during their first rides, and that can lead to many accidents. That’s why taking a few minutes to help them familiarize with the scooter can be quite literally a lifesaver. Thanks to the chain-driven electric motor, you will be able to relax even when watching your child ride. The chain drive and high torque electric motor ensures that the scooter runs smoothly and very quietly. Neighbors won’t be getting angry about the noise, and you will still be able to enjoy a lazy Sunday evening while your kids cruise around and have fun. The battery of the Razor moped has a 24v battery that consists of two 12v batteries. To allow the scooter to be efficiently recharged, it has has a lead acid battery system. The battery charger is naturally included with the scooter upon arrival. The scooter requires at least 12 hours of charging after each ride. The initial charge should be 18 hrs, however this needs to be monitored closely as to not burn-out the batteries quickly. Depending on how fast and how long your child will be riding, the Razor scooter can last anywhere from 30 minutes to 60 minutes upon one ride. 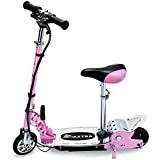 It’s essential to also take into consideration the additional electricity bills expenses that may come with purchasing this Razor scooter. Some people may find that 12 hours of charging for one hour of fun may not be worth it. While others consider that the perfect investment, especially if they have a good electricity plan where the bills aren’t a significant problem. One battery is known to last 250 charges, which means that while you’re at it, you should probably purchase one or two spare batteries just in case. This will ensure that you have a back-up whenever you need it, especially if you have many kids at home that are eager to use the Razor scooter 24/7. Usually, Razor also encourages customers to purchase a large capacity battery, that may allow the kids to ride for at least up to 2 hrs instead of just one! And with spare batteries, you can easily exchange them and keep riding without the fun stopping. The battery power equals to about 250 watts, and the battery charger is UL approved. All in all, the Razor scooter can ride about 12 miles before it starts getting slower and running out of battery. It’s important to be diligent with charging the Razor scooter, and it’s important to not leave it charging for more than 12 hours. Leaving it to charge for longer than needed will drain the battery and make the Razor scooter less efficient and may eventually lead it to stop working. The Razor Pocket Mod has a pair of 12” back and front wheels that are known to not be easily subjected to quick wear and tear. Thanks to the pneumatic material that they are manufactured from, the back wheel and front wheel can endure quite a lot. They are durable, reliable and can drive on hard terrains such as dirt or marble roads. An uneven terrain will be no problem for the electric sports Mod, and it will ride great on both smooth and uneven pavements & roads. Should accidents happen, buying spare 12-inch pneumatic tires won’t be an issue. The rear suspension system also helps young inexperienced riders have a calm, even ride. The brakes on the Razor Pocket Mod Electric Scooter are easy to use, easily adjustable are hand-operated. They remain responsive, simple and safe. Skidding and stopping however is not recommended, since it can cause lasting damage to the 12-inch pneumatic tires or to the rider if they lose control over the handlebars. The brake also has an emergency safety feature that cuts off energy from the mod scooter, allowing the kick scooter to stop immediately. The Razor Mod scooter is ideal for kids between 8 to 18 years old. If you are planning on giving it to younger kids, it’s important to modify the pocket mod scooters maximum speed. 15 miles per hour is extremely fast for any child under 10 years old, and they seem to have a hard time steadily controlling the scooter at such high-speeds. For older kids, the kick scooter should be ideal for moving around the neighborhood. It’s the ideal source of fun and the ideal commute scooter for quick rides whenever you need to run a quick errand. The Razor Mod looks professional, stylish, and has the perfect Euro-Style look and vintage Italian appearance. It runs smoothly, has a quiet electric motor, responsive breaks, durable 12-inch pneumatic tires, and a stunning speed of 15 miles per hour. If your child has outgrown the traditional scooters and bikes and wants something more modern to ride around the neighborhood streets, the Mod will fit perfectly into their every-day routine. If you are looking for an alternative choice, something a bit more outgoing and daredevil-like, we can recommend Razor’s MX500 Electric Motocross Dirt Bike, also known as the Dirt Rocket. The Razor dirt bike has a 500-watt electric motor, can go up to 15 miles per hour, has an original motocross inspired frame, big pneumatic wheels and a sturdy kick-stand so that you can park anywhere. The Razor Dirt Bike is ideal for kids over 14 years of age, has a weight-limit of about 175lbs and remains a customer favorite thanks to its steady, smooth ride and quiet electric motor. Check out the Razor MX350 dirt rocket as another alternative. Looking for something a bit different? We’ve also reviewed the Razor Dirt Quad, as well as the all-amazing Razor Dune Buggy and even the Razor Crazy Cart for Kids, too!